2.008 is the upper level design and manufacturing class for mechanical engineering students at MIT. It is a project-based course in which the main task is to design a yo-yo, manufacture the molds, injection mold, thermoform and assemble 50 functional units in teams of 5. My team and I wanted to make a creative yo-yo that had not been done in prior years. We were inspired by breakfast, and wanted to make something that looked cute and realistic. We eventually settled on the waffle yo-yo after considering several ideas, but valued the challenge in designing the waffle mold. We used Solidworks to make the plate, waffle, and butter molds, and then used MasterCAM to simulate the machining. After confirming our designs, we used a CNC mill and lathe to manufacture our aluminum molds, and produced more than 50 fully functional yo-yos. Solidworks model of the assembled yo-yo. 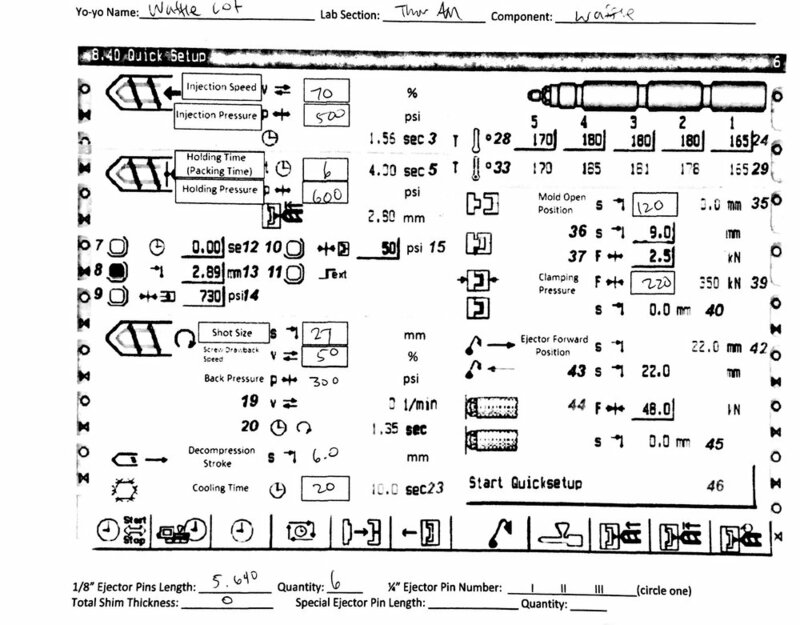 Set-up sheet with final injection molding parameters for the waffle piece. We measured snap fits and assembled each of the prototypes. More information about this project can be found on our process blog here.